The multistorey building commissioned by Dresdner Bank is situated at the Gallusanlage, not very far from the opera house. 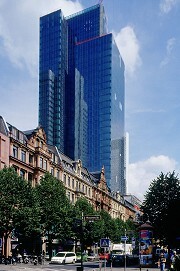 The office and administration building is 38 floors high and was completed in 2003. The ground level features a shopping and leisure centre as well as a newly built theatre. All dry constructions were carried out by R&M, including stud walls, fire proofing walls (fire protection classification F90) and the theatre's acoustical ceilings. It was my task to plan the construction drawings of all relevant stud walls in the building. These drawings include the precise position of the profiles, all wall breakthroughs (in accord with building services such as heating, ventilation, air conditioning and refrigeration), and also the design and implementation of fire shutters and other details.